The Putnam County UT Extension Master Gardeners are preparing to grow flowers and vegetables for our 6th annual plant sale! Profits from the plant sale support PCMG projects throughout the year including the various demonstration gardens we plan and maintain in Cookeville, scholarships, and donations to schools and other projects. In the past 5 years, we have learned a lot about growing plants in our greenhouse. We have encountered a few challenges along the way, but none that prevented us from persevering, learning, teaching and in the end, growing healthy and beautiful plants! The one thing that is consistent is the inconsistency of our Tennessee weather. Some years, the weather could not have been better with perfect spring temperatures and plenty of sunshine while other years we needed to hire a private investigator to find the sun. With the mild winter we have had this year, will spring be beautiful or will winter come late? We will find out soon enough but one thing that is certain the enthusiasm of our master gardeners and interns will come shining through. Tomatoes and peppers are becoming our signature items. This year we will have 17 different varieties of tomatoes; everything from canning, slicing and salad, to a variety that can be grown on your patio. Many of our plants are grown from seed by our master gardeners and interns. This allows us to feature more heirloom and hard-to-find selections. Of course we will also have several tried-and-true hybrids for gardeners who prefer them. Bonnie Coburn, our pepper expert, will be starting all our peppers from seed -- from mild to extra hot and everything in between! Of course, our sale will feature other vegetables, herbs, annuals and perennials. We plan to provide a few classes this year as well. Rita Venable, author of the book, “Butterflies of Tennessee” will be teaching a Butterfly class on Saturday afternoon. Other classes being offered are: “Composting at home”, Bees in your garden and Tomatoes 101. 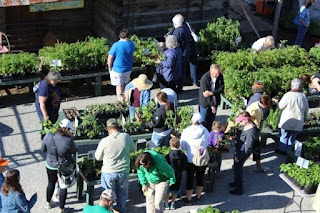 During the two days of the plant sale, Master Gardeners will be available to answer questions, offer customers boxes, and carry items to their cars…. rain or shine. Once again, quality plants will soon be in gardens throughout our area, thanks to the diligent care given by master gardeners and interns who not only nurtured plants but nurtured knowledge and friendships! Check back here in mid-April for a complete listing of plants available in the sale.